Many machine tool manufacturers are looking for smart ways to improve their products and processes. This also applies to the use of C parts. When it comes to cable, assemblies provided directly by the manufacturer are particularly attractive. This is why we offer our customers innovative assemblies for all their needs. 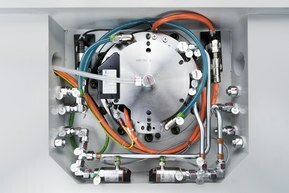 EMAG Maschinenfabrik GmbH is one of the first companies to have ordered the smart servo assemblies from Lapp. “We have very high requirements when it comes to quality and we looked closely before choosing Lapp. Alongside their excellent quality, it was also their outstanding logistics that finally tipped the scales”, explains Dr Guido Hegener, Managing Director of the EMAG group. ÖLFLEX® CONNECT SERVO is the latest generation of Lapp servo assemblies. These combine technical properties like excellent electromagnetic screening with consistently high quality and global availability. The servo assemblies were made possible by new components developed in an innovative process. Previously, the process of hanging and stripping the cable was done purely by hand, along with attaching the connector. For the ÖLFLEX® CONNECT SERVO, the only part of the process performed manually is the insertion of the cores into the insulation using a special mechanism. Everything else is automated. What makes this production process so special is the way the blades cut the cable to the right length and strip the insulation to the right stages. This means that the sheath is shorter than the braided shield and the inner sheath is shorter than the cores. The individual cores are then pressed into the contact to improve contact quality. The transition between the cable shielding and the connector housing is produced manually, and allows unique 360-degree shielding. This improves the shielding effectiveness by up to 400% compared to conventional servo assemblies. The inner sheath beneath the shielding also protects the cores and keeps the internal cable components in place, even under high mechanical loads. 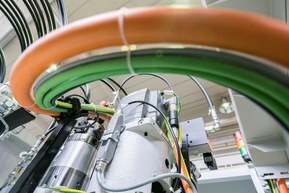 Upon its launch, Lapp offered six cable types with varying diameters for the Siemens standard. This range was later expanded with additional variants. Customers can also choose between Basic Line, Core Line and Extended Line to meet different demands. The semi-automated assembly process developed by Lapp's engineers is a huge step forward. The servo assemblies' electromagnetic compatibility is far better. Alongside the outstanding technical characteristics, the semi-automated production process is much easier to repeat than a manual process. This allowed Lapp to construct production facilities in Germany, the USA and Singapore to manufacture the new ÖLFLEX® CONNECT SERVO, whilst also ensuring consistently high quality and global availability. For servo assemblies, this was a huge leap forwards from the previous manual production method. This is particularly advantageous for global companies that manufacture their products worldwide and want to avoid using different solutions in different locations that require individual validations. Furthermore, the assembly can be easily adapted to different manufacturer standards. The Lapp solution also helps save personnel costs. The EMAG group is a leading manufacturer of production systems for precision metal parts. The company is based in Salach near Stuttgart.